Examining the political ordeals of the Southern half of our hemisphere. "Those who make peaceful revolution impossible will make violent revolution inevitable." President John F. Kennedy spoke this warning to a gathering of Latin American diplomats in the spring of 1962, as Cold War-era civil conflicts were beginning to intensify and spread through the hemisphere. Kennedy turned out to be prescient: Latin American leaders, with the support of Washington cold warriors, clamped down on peaceful left-wing reform movements and thus helped spur the rise of violent revolutionary alternatives. Social and political struggles escalated into full-blown civil wars. These may be matters of mere historical interest in the United States, but they unleashed a dynamic of authoritarianism and violence that plagues Latin America to this day. Much of the region is still struggling to come to terms with the legacies of bloody, decades-long conflicts. In Chile, only recently has justice threatened to penetrate the shield of impunity long enjoyed by politically motivated murderers. In Colombia, meanwhile, a hydra-headed, cocaine-fueled civil war continues to claim several thousand lives a year. In these cases and others, the search for truth, or at least some semblance of understanding, has just begun. When a Colombian paramilitary kills hundreds of people in the name of justice and decency, it echoes the "strange moral calculus of mass murder" that John Dinges, a veteran journalist and former managing editor of National Public Radio, describes in The Condor Years: How Pinochet and His Allies Brought Terrorism to Three Continents (New Press, $25.95). 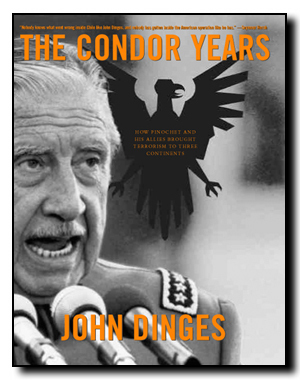 Dinges uses the phrase to characterize Manuel Contreras's cool justification of his roles as head of Gen. Augusto Pinochet's DINA intelligence agency and architect of the South American intelligence and assassination network known as Operation Condor. By cruelly and decisively "suppressing terrorism and subversion," Contreras's argument goes, Chile became "the first country in the world that succeeded in eliminating terrorism from its territory," thus avoiding the kind of civil conflict that left hundreds of thousands dead in the rest of Latin America. That Dinges does not dismiss such arguments out of hand indicates the subtlety and insight of his account of Condor -- to his mind the "final, worst departure from the rules of law and civilized society" in Cold War Latin America. Over several years in the second half of the 1970s, intelligence agencies in Chile, Argentina, Uruguay, Paraguay, Bolivia and Brazil collaborated in tracking, kidnapping, torturing and killing "enemies" of their military regimes. On the one hand, Dinges points out, such tactics made some sense in the face of the legitimate (if inflated) threat that the revolutionary left represented. More often, however, Condor targeted pro-democracy and human rights activists, religious leaders, opposition political leaders and peaceful dissidents -- all in the name of winning a self-anointed "war on terrorism." Drawing on a trove of declassified documents and personal interviews, Dinges assembles a scrupulous, well-documented and indignant prosecutor's brief, all the more arresting for its judiciousness and restraint. In reconstructing Condor's most infamous act -- the 1976 car bombing that killed the Chilean dissident Orlando Letelier and an American colleague in Washington, D.C. -- he weighs the evidence of whether U.S. officials could and should have prevented the assassination. As with similar questions of U.S. complicity in the atrocities of Pinochet and his Condor allies, his analysis is cautious and fair: While a number of officials, from Secretary of State Henry Kissinger on down, should have "connected the dots," there is no proof that any of them did. There is evidence that many knew exactly what Condor entailed and that a more definitive U.S. stance against Condor's brand of international terror might have averted dozens of cases of torture and murder. But Washington's "green light, red light" approach to the promotion of democracy and human rights in Latin America signaled clearly that the demands of an anti-Marxist crusade trumped such secondary concerns. Throughout, Dinges is driven by an abiding belief that "the unresolved crimes of the past do not remain in the past." He argues that recent judicial efforts in Europe, Chile and Argentina to punish the crimes of the Condor years will usher in "a pioneering new era of international law" -- forcing individuals who invoked historical imperatives in defense of their crimes to face long neglected questions of personal responsibility. Daniel Kurtz-Phelan is an associate editor at Foreign Affairs.